Stainless steel support legs are 41 mm (1 5/8 in.) diameter complete with adjustable leveling foot. Standard-duty dishtabling shall be manufactured from 1.6 mm (16 ga.) type 304 stainless steel. Stainless steel tubular support legs and cross-bracing members are 41 mm (1 5/8 in.) diameter. Legs are equipped with adjustable, self leveling feet. Standard 200 mm (8 in.) high, splayed backsplash is provided with faucet mounting holes on 200 mm (8 in.) centers. 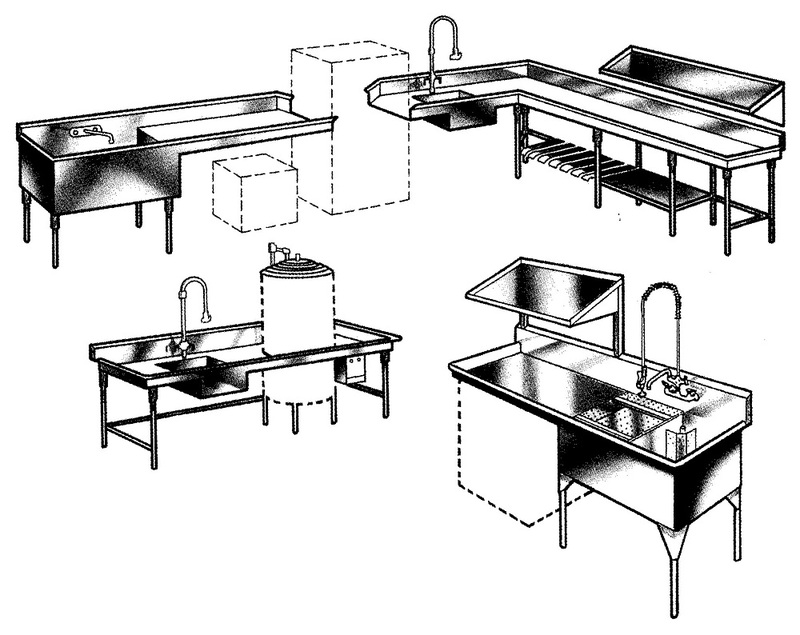 Individual or double drainboards are available as indicated. Standard sink basin depths is 350 mm (14 in). Galvanized-steel, tubular leg supports and/or cross bracing shall be 41 mm (1 5/8 in.) diameter. Legs shall be equipped with adjustable, self-leveling feet. Fully-coved sink basin manufactured from 1.6 mm (16 ga.) type 304 stainless steel. Rolled-rim safety edge perimeter on sink basin is standard. Stainless steel tubular support legs, 41 mm (1 5/8 in.) diameter, are equipped with 100 mm. (4 in.) diameter swivel casters. Legs are secured to sink basin by extended, reinforced, stainless steel gussets. Sink basin is provided with a lever-action release drain having an extended tail-piece for ease in draining.